Live in style in this aristocratic palazzo with pool! Inside: Palazzo Colucci is situated on the first floor of a historic aristocratic palazzo. The original wide stone staircase leads up from street level to the apartment's entrance. Inside is a reception room and a dining room with garden views. To one side of the reception area is a superbly spacious kitchen mixing the functionality of induction cooking with the memories of the original cucina. Next to the kitchen is a laundry room. On the other side of the reception room is a large sitting room with sofas, TV and a terrace overlooking the garden. The four bedrooms (two doubles and two double-twins) are accessed from the four corners of this sitting room. All the bedrooms have their own en-suite bathrooms (three with shower, one with tub and shower attachment). Two of the bedrooms have garden views, the other two have views towards the village. Outside: the garden and the pool are accessed via a flight of stairs leading down from a corner in the living room. The mature garden is contained by the original high walls, and features lawns, trees, a large variety of plants and a wonderful swimming pool. There is a shady al fresco dining area served by a barbecue and an outdoor kitchen (a couple of hobs, a sink and a fridge), and plenty of shady spots for relaxing in this green oasis. Palazzo Colucci is set in the centre of the tiny “borgo” of Specchia Gallone, the most important buildings of which date from between the 13th and 17th centuries. Just outside the gates, take a stroll through the streets of the typical small town, admire the Capella di Sant’Anna or the Palazzo Baronale, stop for an espresso at the bar, dine or have a good beer at the local alehouse, or wander down to a couple of local restaurants in the neighbouring town of Minervino about a mile away. The ground floor apartment is occasionally occupied (generally a few weeks over the summer), but the gardens and pool remain exclusively for the use of our guests. The charming borgo of Specchia Gallone is well situated in rolling countryside dotted with authentic towns and villages, and is just 15 to 20 minutes drive from a selection of beautiful coastal locations including the fishing village of Porto Badisco, the walled fortress port of Otranto and the cliff top castle of Castro. There are plenty of opportunities locally for exploring the historic and rural culture of this area of Salento, and small towns such as Uggiano, Minervino, Muro Leccese, Maglie and Poggiardo are blessed with beautiful architecture, centuries old traditions and some great local trattorie. The stunning UNESCO heritage centre of Lecce and Gallipoli are both easy day trips, as are the white sand beaches of the Ionic coast. All in all, Specchia Gallone is strategically situated for an in depth exploration of the best that the Salento peninsular has to offer. "Amazing property. An incredible stay. First time user and will book again. Appreciated the carefully curated property list." Amazing property. An incredible stay. First time user and will book again. Appreciated the carefully curated property list. 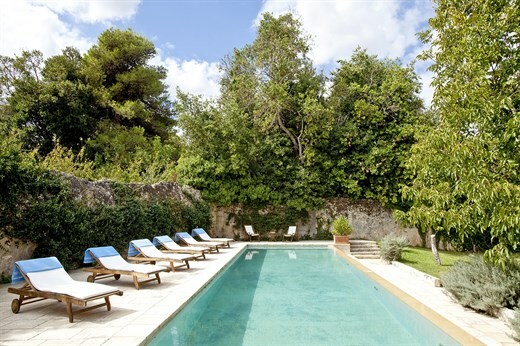 We loved the space at Palazzo Colucci and the garden and the pool were a joy. With 3 generations in one property it's good to be able to find a place for peace and quiet once in a while. We enjoyed going to the bakery in our village every morning for breakfast bread and pastry and stopping off for coffee at the bar on the way back, in fact there was competition to be first up to be able to do this. We all loved morning coffee in the bar, everyone was very friendly and we started to feel like part of the community. Our holiday? We loved it all. Palazzo Colucci is magnificent and tastefully restored. It is in a very peaceful setting in a small village with friendly locals. The little supermarket is almost next door, the bar is opposite and the excellent bakery just around the corner. The supermarket stocks a good selection of local cheeses and meats and wines at very reasonable prices. The bar/cafe was a regular meeting place for the male population with a friendly and welcoming owner. The bakery is very good with a variety of delicious bread - crunchy and fragrant. The staff housekeeper was charming and willing to help and the cook produced two excellent dinners. Palazzo Colucci was spectacular, better than we expected. The staff were so kind and very helpful. We wished we were staying longer. All good. Palazzo Colucci is a fabulous and special place to stay. Peaceful and spacious. Delightful pool. The inside of the villa was exactly as photographed and the height of the ceilings was a nice surprise. Very grand, palazzo-like even more so than came across in the photographs.The quality of the furnishings and all the systems was excellent. The staff were so very sweet and helpful... Your Local Representative, Carmen, is a true treasure. I don't know how you found her, but she is a real prize! We very much enjoyed this trip. We had a great holiday. Palazzo Colucci was a beautiful house and centrally located. The local residents at Specchia Gallone were very friendly and welcoming... We have already recommended friends to use The Thinking Traveller. Your guys are very thoughtful and professional. Well done! An excellent holiday. A wonderful place. It was a glorious experience. The combination of the residence, the quality of living of Puglia and the friendship of the local people are a recipe for success. How did we enjoy our holiday overall? We did not want to come home!